Arunachal Pradesh Deputy Chief Minister Chowna Mein, accompanied by the Minister of Environment and Forest Nabam Rebia and the Chairman of Science and Technology Bamang Mangha, visited the under-construction four-storied building of the proposed Centre for Bio-resource and Sustainable Development at Kimin in Papum Pare district of Arunachal Pradesh on Saturday. Mein interacted with the scientists of the centre and urged them to work with true professionalism. 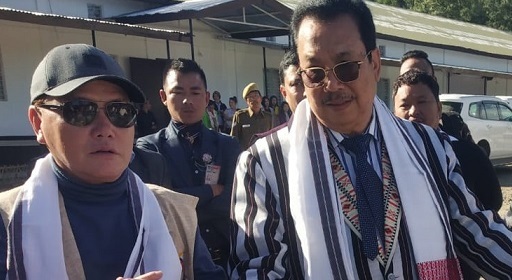 He said that Arunachal has huge scope for research and development works in the field of bio-resource but the need of the hour is a professional zeal to do so. He said that the government is emphasizing on Research and Development wing in the State, and the scientists in return should show something by their output. He said that there is also scope for developing butterfly parks and bird bio-reserves in the State. He suggested planting more fruit trees in the vicinity to turn the entire area into bio-reserves along with the research centre. He also suggested a guest house in the compound where visitors/tourists from outside the State can be given a comfortable stay. Mangha said that the Rs 50-crore project for the proposed centre is being developed under the Central Department of Science and Technology. “This bio-resource centre spread on seven acres of land would be the second in the Northeast and it will become the main centre of research work in the State. It will also facilitate the State departments as well as the students of NERIST and RGU in their research works,” he added. He thanked the State Government for approving an annual recurring expenditure of Rs five crore for the Bio-resource Centre which he said is a big encouragement for the project and research works. He also said that eight scientists are already working at the centre. The team was accompanied by Kimin SDO Likha Teji and others.